Remember this little guy: http://wp.me/p17T6K-yP ? Well, here’s its close relative. The last one I had was without identifying numbers; this ones a 1332, which makes it mid to late thirties. That’s the same nib as some of the Onotos, so you know it has to write well. And so it does. I tried it and it writes beautifully, a semi-flexible medium. 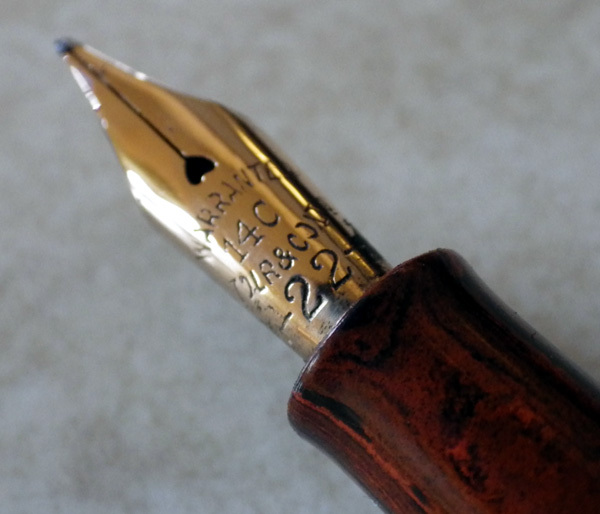 If you were rigidly practical, that’s all you need to know – that the pen writes well. But of course none of us are entirely practical or we wouldn’t be deep into the world of fountain pens. So it doesn’t hurt that it’s beautiful, that the blue latticework throws the light back at you with an almost metallic shine, that the mottled hard rubber finds some kind of absolutely right harmony with the latticework and the overall design of the pen is that of an object intended to work, but also to please. As pen makers, De La Rue were early in the field and could have chosen any logo that they wanted. What did they choose? A sunburst, a very common image. Many years later this caused confusion because jobbing parts makers turned out levers with sunbursts on, just to convince puzzled pen collectors that all sorts of cheap pens were made by the prestigious De La Rue. Anyway, the pen’s the important thing. Isn’t it a beauty? 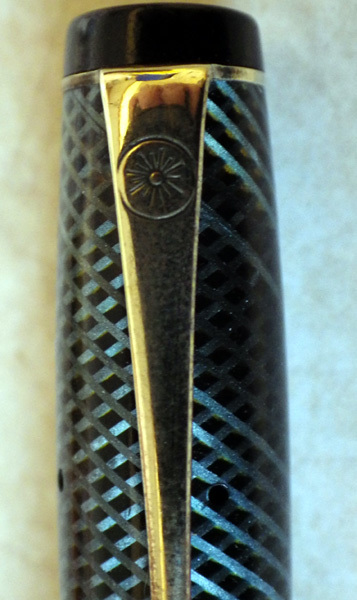 Yes, it certainly is a beauty, about as nice a 1930s pen as I can remember seeing. Decorative without being gaudy.